Bar Charts are the most simple and easiest way to generate construction schedules. It is widely used due to its simplicity and multiple adaptations to numerous events. A bar chart is formed with a list of activities, specifying the start date, duration of the activity and completion date of each activity, and then plotted on a project timescale. The detailed level of the bar chart depends on your project complexity and the intended use of the schedule. A variation of the bar chart schedule is the linked bar chart. A linked bar chart uses arrow and lines to tie the activities and subsequent items, specifying the successors and predecessors of every activity. The previous activities are linked one to another to demonstrate that one activity must be completed before the other activity can start. Bar charts are useful and used to detect the amount of resources needed for one particular project. Resource aggregation is done by adding resources vertically in the schedule. The purpose of this aggregation is to estimate the work production and establishing estimates for man-hour and equipment needed. This process is more complex and detailed than the previous one. With a large list of activities, each activity is then linked to previous and subsequent activities, specifying that each activity has at least another one that must be completed prior to starting the preceding one. The Critical Path Method establishes and assigns start and end dates based on certain logic like FS, FF, SS, SF that are key indicators of how activities must be sequenced. These constraints determine the first date that an activity can start; late start, specifying the last possible date that this activity must be started to avoid delays in the overall construction process; early finish, the earlier date that the proposed activity will be completed; and the late finish, that is the last date the activity must be completed without affecting the start of the next one, and subsequently affecting the entire construction scheduling resources. 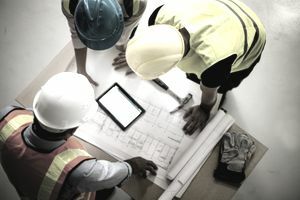 This construction scheduling process is a planning technique for repetitive work. The essential procedure for this scheduling technique is to allocate the resources needed for each step or operation, so the following activities are not delayed, and the result can be obtained. The principles employed are taken from the planning and control of manufacturing processes; a process usually applied in the construction work and more specific in road construction. It is very powerful and easy to use process when the conditions are ideal for this type of work. Q Scheduling is quantitative scheduling, in the context that quantities to be executed at different locations of the construction project form the elements of the schedule. Also, Q Scheduling is Queue Scheduling in the context that trades pass through the different segments of the project in a queue sequence. No interference between two activities is allowed at the same location. It is derived basically from the Line of balance technique with some modifications to allow for the nonrepetitive models that are characteristic of the majority of construction projects. The Q Scheduling is a new technique, though getting rapid popularity among contracting firms. It is the only scheduling technique that reveals a relation between the sequence of doing a job and the cost to be incurred. The Q schedule is similar to the Line of Balance with some modifications, to allow for a varying volume of repetitive activities at different segments or locations of the construction project. Thus the model produced is closer to reality.